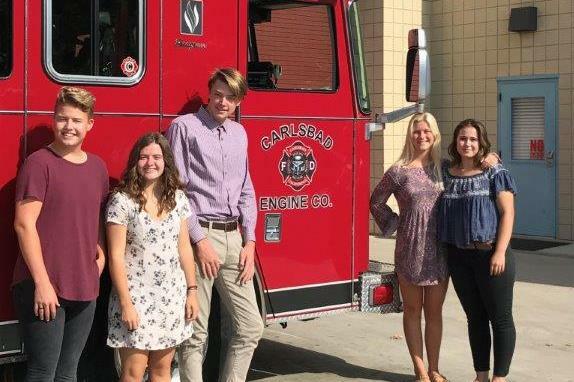 CARLSBAD — In an effort to enhance fire and rescue services, support safety education and provide scholarships to the children of Carlsbad firefighters and paramedics, Frank Whitton created the Carlsbad Fire Department Foundation. Since its launch in January 2014 the organization has purchased nearly $20,000 in equipment and awarded $13,000 to four students, including one who is pursuing a medical career at New York University. While those accomplishments are impressive for a young nonprofit group, Whitton is somewhat disappointed. Carlsbad’s 2015 Citizen of the Year, Whitton retired as a lieutenant colonel in 1978, following 23 years of military service with the U.S. Marine Corps. A Carlsbad resident for more than 20 years, he has spent much of his time as a volunteer with the city, including time on the Traffic Commission, Juvenile Justice Panel and Planning Commission, where he served for seven years. Whitton said he spent about a year completing the required paperwork for a nonprofit and asked his son, an attorney, to look it over. “He threw the whole thing away and 10 days later I got a legal document he had already submitted to the IRS,” Whitton said. He then submitted it to the fire chief, who approved the plan. But Whitton said it was missing a key component. “I told him it had to have a scholarship program for the children — vocational and collegiate,” he said. Once that was added Whitton had to recruit unpaid help to form a required board of directors. He went to the Knights of Columbus council at his church, St. Elizabeth Seton, and almost immediately had four volunteers. The foundation has three major fundraisers. Discounted tickets to Legoland are available for $35 on Firefighters Appreciation Day on Sept. 12. The foundation receives $5 for each ticket sold. Last year the theme parked matched the $1,500 raised by the foundation. Ruby’s Diner at the Carlsbad Premium Outlets is donating 20 percent of all food and beverage sales all day on Sept. 21 when a required flier is presented. The largest fundraiser is a golf tournament and dinner scheduled for Oct. 26 at The Crossings at Carlsbad. Sponsorship opportunities are available between $300 and $10,000. Tournament and dinner fees range from $800 for four golfers, lunches and dinners and 12 drinks to $45 for dinner only. The current goals of the foundation include funding communications, protective, safety and other equipment, educational outreach, technical upgrades and the scholarship program. And Whitton already has plans for expansion. Whitton said he would like to buy a retired fire truck and convert it into an educational tool that would travel to local schools, city events and senior citizen centers to increase fire protection awareness and teach people fire prevention measures such as how to use fire extinguishers and maintain carbon monoxide alarms. “People in the community don’t know what the Fire Department wants to do for them and what their extended capabilities are,” Whitton said. Mike Davis, the new fire chief, said he is grateful for the foundation. Davis said the foundation also allows his department to do some fun things because there are fewer restrictions on how the money can be spent. One example, he said, was a recent bike rodeo to teach bicycle safety. Davis said he used some of the foundation funds to buy red bike helmets. “We put Carlsbad Fire Department stickers on the side,” Davis said. “It was a hit. The kids loved the helmets and learning how to ride bikes from firefighters. “Those are some of the fun things the community can enjoy and it helps us in our mission to protect life, property and the environment, preferably through prevention rather than response,” he added. Visit carlsbadfdf.org for more information on the foundation, its fundraisers or the required flier for the Ruby’s event.